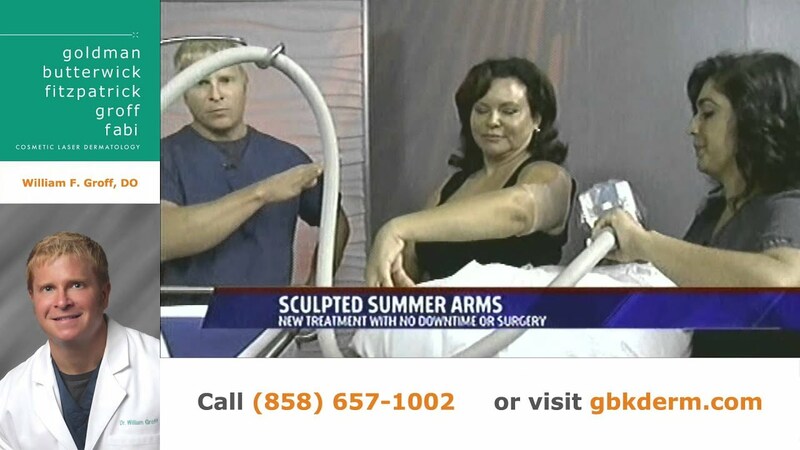 Eliminate the appearance of “batwings” on the upper arms with a variety of non-invasive skin tightening devices. When it comes to body sculpting, most people immediately think of the abdomen and love handles, maybe the thighs. However, the arms, especially the upper arms, often get saggy as we age, creating “batwings,” and for many people, the upper arm is an especially difficult area to lose weight in. There are solutions, however! 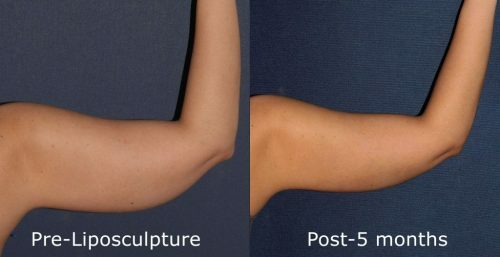 Upper arm skin can be tightened non-surgically with a variety of non-invasive skin tightening devices, such as Ultherapy or ThermiTight, and stubborn fat deposits in the upper arms can be reduced significantly through either liposuction or non-invasive fat reduction devices such as CoolSculpting. If you are interested in regaining a youthful and healthy contour to your arms, don’t hesitate to contact the skilled, board-certified dermatologists at Cosmetic Laser Dermatology in San Diego. Our expert doctors have years of experience in both skin tightening and body contouring in all areas of the body. Cosmetic Laser Dermatology also offers the widest array of non-surgical skin tightening and body shaping devices on the West Coast, in addition to surgical liposuction. We have our own in-house operating room as well, meaning that we can perform liposuction on location and we can also administer anesthesia in order to make any procedure you have with us as comfortable as possible. To schedule an arm contouring consultation with Cosmetic Laser Dermatology in San Diego, just contact us today. We will be happy to answer any questions you may have and to make an appointment at your earliest convenience. Our doctors (with the exception of Dr. Goldman) offer complimentary consultations to help you decide upon the best treatment course to address your concerns in the most satisfactory manner. “Batwing” arms, where the skin on the upper arm is lax and sagging, is a problem for many people, especially older women. It can also happen if a person has lost a lot of weight in a short period of time. When this happens, a person may not want to wear short sleeves or sleeveless tops and dresses and may feel the need to wear a cardigan at all times, even in warm weather. Bathing suits may also become a problem. 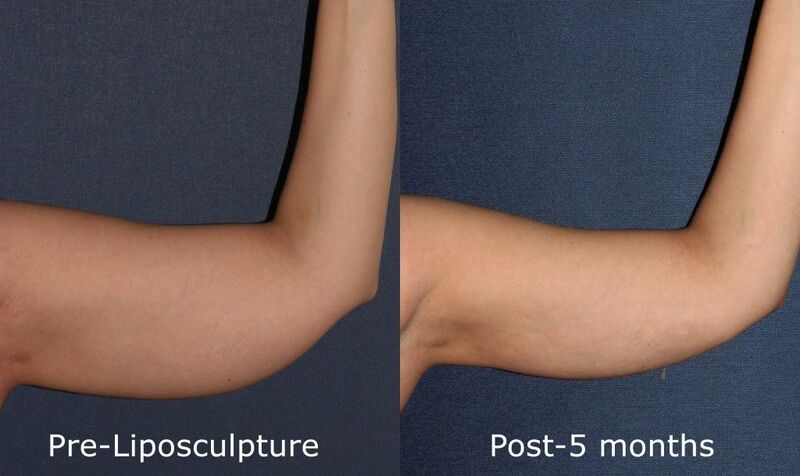 In the past, traditional surgery to cut off excess skin was the only option to reduce sagging skin on the upper arms. Nowadays, however, there are many non-invasive skin tightening procedures that can help to tighten skin that is mild to moderately lax. 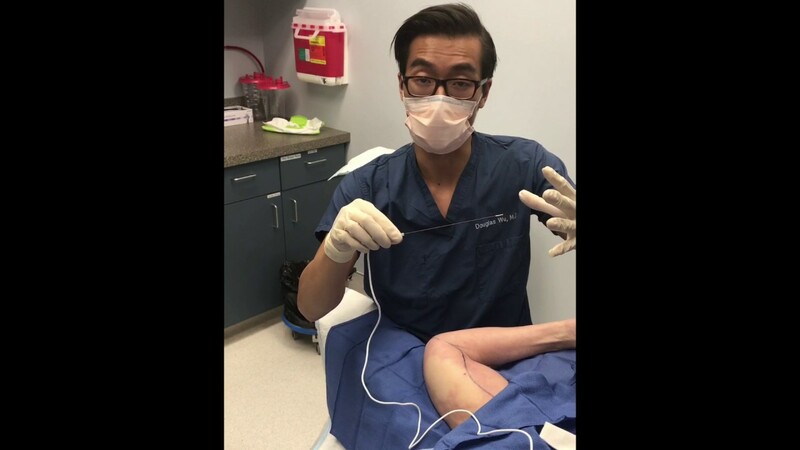 Severe laxity, unfortunately, may still need to be addressed with surgery for the best results. Ultherapy is one such skin tightening device that can be used on the upper arms. Ultherapy uses ultrasound energy to penetrate deep into the dermis and stimulate collagen production as well as cause retraction of the skin. It is FDA approved for use on the face, neck, and chest, but here at Cosmetic Laser Dermatology in San Diego, we have used it successfully to treat sagging skin on the upper arms. ThermiTight is a popular and effective device that can both reduce unwanted fat bulges and tighten the skin on the upper arms. ThermiTight is minimally invasive in that it uses a small probe inserted underneath the skin to channel radiofrequency energy to precisely targeted areas; however, it is very effective and patient satisfaction is very high with this device. CoolSculpting is a revolutionary device which uses proprietary cryolipolysis technology to “freeze” and destroy fat cells. 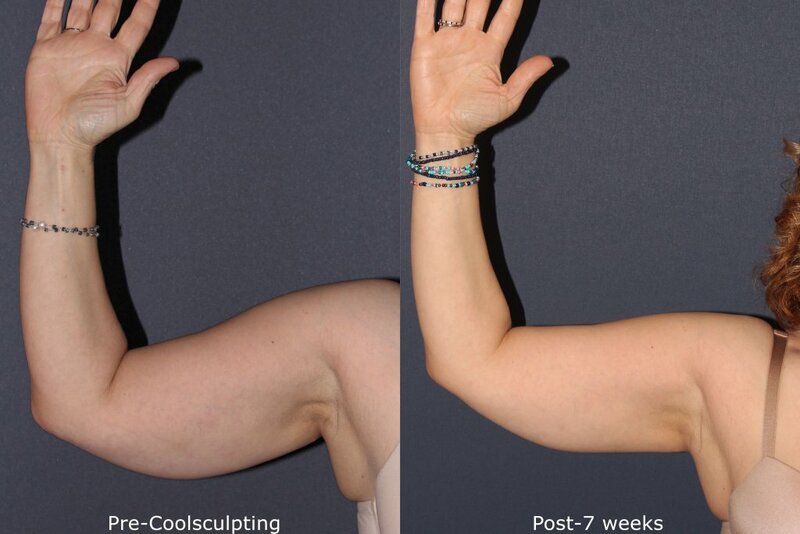 CoolSculpting can be very effective on the arms in the right candidate. Call us today in San Diego to learn about all of the non-surgical fat reduction devices we have available! If rather than loose skin, your problem is excess subcutaneous fat in the upper arms, then liposuction or a non-surgical fat reduction option may be right for you. Fat in the upper arms can be quite difficult to get rid of, especially if you are genetically predisposed to gain weight in that area. 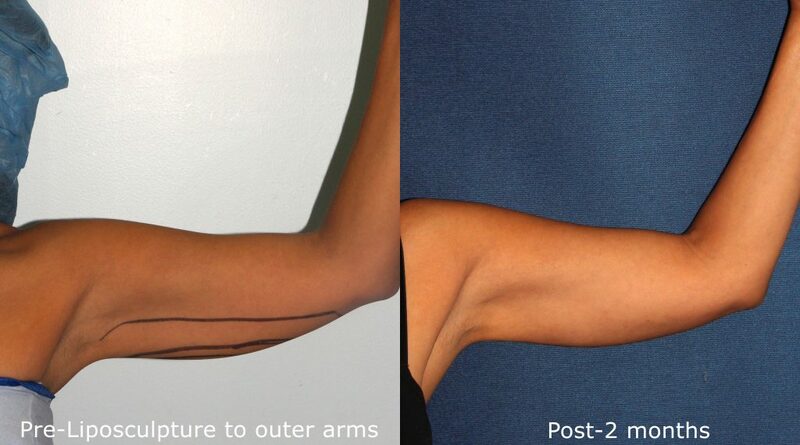 However, liposuction and other fat reduction devices can help you to achieve the arm contour you want. Liposuction, or liposculpture as it is also known, is a minimally invasive procedure in which fat cells are manually extracted from the body using a small cannula. Liposuction has been performed for decades and is very safe. It is the most effective way to reduce unwanted subcutaneous fat and achieve a better body contour. Liposuction does have a longer recovery period than non-surgical means, but it will deliver the most dramatic results by far.